The first book in the Old Testament, The book of Genesis, is a book about families. The genealogies there are very important, and we see them here as we start the New Testament. At first this looks rather boring. You give someone a New Testament, and they begin here in the Gospel of Matthew with a genealogy staring them in the face, and they are not going to get very far in it. The New Testament rests upon the accuracy of this genealogy because it establishes the fact that the Lord Jesus Christ is of the line of Abraham and of the line of David. Both are very important. The line of Abraham places Him in the nation, and the line of David puts him on the throne-He is in that royal line. The genealogies were very important to the nation Israel, and through them it could be established whether a person had a legitimate claim to a particular line. For example, when Israel returned from the captivity, we find in the Book of Ezra, “These sought the writing of their genealogy, and found it not, and they were cast out of the priesthood.” (Ezra 2:62). It was possible in Ezra's day to check the register of the tribe of Levi and remove those who made a false claim. Evidently these genealogies were kept by the government and were accessible to the public. I think they were kept in the temple because Israel was a theocracy, and actually for loss of a better word, the “Church” and the state were one. This genealogy was obviously on display and could have been copied from the public records until the temple was destroyed in A.D. 70. The enemies of Jesus could have checked them and could have checked them and probably did. This is interesting and important because they challenged every move of the Lord Jesus, even offering a substitute explanation for the Resurrection, but they never did question His genealogy. The reason must be that they checked it out and found that it was accurate. This is most important because it puts Jesus in a very unique position. Jesus was born in the line of David and in the line of Abraham. This is what Matthew is putting before us. He is the fulfillment of everything that had been mentioned in the Old Testament. So the enemies of Christ never could challenge Him in regard to His genealogy. They had to find some other ways to challenge Him, and, of course, they did. This is the genealogy of the Lord Jesus on Joseph's side. We will have another when we get over to Saint Luke's Gospel, and that will be from Mary's side. 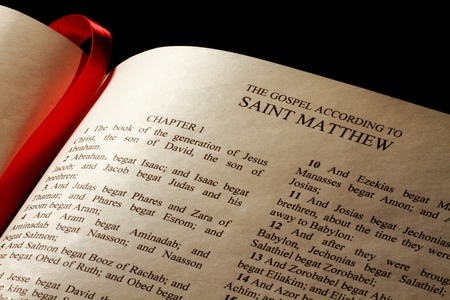 "The book of the generation of Jesus Christ, the son of David, the son of Abraham:"
“The book of the generation” is a phrase which is peculiar to Matthew. It is a unique expression, and you will not find it anywhere else in the New Testament. If you start going back through the Old Testament, back through Macchabees, Malachi, Zechariah and Haggai and back to the Penteteuch, through Deuteronomy, Numbers, Leviticus Exodus into Genesis you will almost come to the conclusion that it is nowhere else in the Bible except here in Matthew. Then all of a sudden, you come to the fifth chapter of Genesis and see verse one. “This is the book of the generation of Adam...” There is that expression again. There are two books mentioned in scriptures. The book of the generation of Adam and the book of the generation of Jesus Christ. How did you get into the family of Adam? We got there by birth. But the problem is that in Adam all die. As it says in Romans 5:12 “Wherefore as by one man (Adam) sin entered into this world, and by sin death; and so death passed upon all men, in whom all have sinned.” So in a way you can say that Adam's book is a book of death. "Baptism may be rightly and accurately defined: The Sacrament of regeneration by water in the word. By nature we are born from Adam children of wrath, but by Baptism we are regenerated in Christ, children of mercy. For He gave pwoer to men to be made the sons of God, to them that believe in his name, who are born, not of blood, nor of the will of the flesh, nor of the will of man, but of God." We become born again by being baptized. We all are in the first book, the book of the generation of Adam. I trust that you dear listener are also in the Lamb's Book of Life. If you are not please contact us at the Vatican In Exile Catholic Radio Web Site, thats VIE catholicradio.com and go to the contact page. We desire to help you find your way to Christ.